WOODSTOCK, Conn. (AP) — The puppeteer who has played Big Bird on “Sesame Street” is retiring after nearly 50 years on the show. 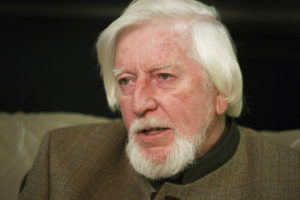 Caroll Spinney announced in a statement Wednesday that he’s handing over Big Bird and his other character, Oscar the Grouch, to younger performers. The 84-year-old joined “Sesame Street” at its inception in 1969. Spinney says he didn’t feel like his work was important until Big Bird helped him find his purpose. Spinney says the physical requirements of performing the characters had become difficult and he developed problems with his balance. He stopped doing the puppeteering for Big Bird in 2015 and now only provides the voices for him and Oscar. His apprentice, Matt Vogel, will succeed him in the Big Bird role. Vogel also plays Kermit the Frog. 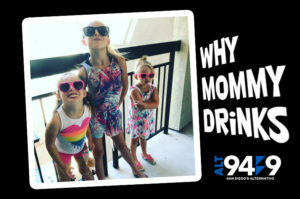 When Dana isn't holding down mornings on ALT 949 with Jayson, she's helping her husband raise three daughters under the age of 10. Fun, right? Dana loves her family, and would do anything for them, including keeping her mental sanity any way she can. Every week, we peel back the curtain on her home life and find out the latest reason Why Mommy Drinks! If you’re thinking about starting a family. Listen to this segment first. What could possibly go wrong with a few boxes of Trader Joe’s muffins? After channeling her inner Barefoot Contessa, there is trouble brewing in Dana’s kitchen. Can she handle the heat? We found out with Reason #51 Why Mommy Drinks on San Diego’s Alternative. Amber and Sara are radio hosts on KSON and Sunny 98.1, Jessica is producer for John & Tammy in the Morning on KSON. They're also San Diego moms! Each week, they meet to vent about what’s been going on in their lives as moms and invite you to vent along with them! The Halloween Struggle is Real! 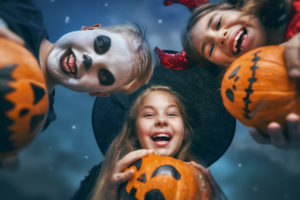 We’re talking Halloween, costumes, whether to hand-make them or not and making Halloween memories. 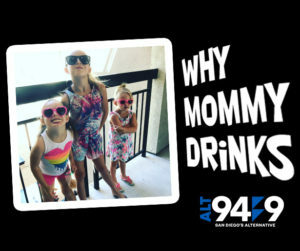 Podcast: Why Mommy Drinks – Play Date! Sometimes it isn’t just your biological children that can drive you to hit the bottle. Dana found that out the hard way this week when her daughter called in reinforcements to completely dominate her free time. How much trouble can a play date possibly be? When you’re traveling across the country with three daughters under the age of 10, you’re bound to have plenty of reasons to reach for a little liquid encouragement. This week, Dana hand picked one of them, and peeled back the curtain on her home life to let us know what luggage oversight caused a family vacation catastrophe before the plane ever left the runway in San Diego.